In Search of Excellence – by Alexandra Kurland | Train Positive Dog! Alexandra leads the vanguard of equine clicker trainers – a growing group of trainers who are using positive reinforcement in an arena traditionally filled with physical restraints, punishments, and forceful training for the horse. The training principles that Alexandra espouses, based on scientific knowledge of how animals learn and how their brains function, are the same for horse and dog and human. The illustration of a neuron above shows the myelin sheath that covers the chain of cells through which a nerve impulse is transmitted. Behaviors – sitting, eating, running – are the results of transmitted nerve impulses. The myelin sheath insulates the nerve cells and makes transmission of impulses more efficient. The more often a circuit is used, the more myelin increases and enhances impulse transmission. The key to making trained skills automatic starts with slow actions and focuses on details. That’s why we start teaching the dog to walk on leash one step at a time. And even before that one step there are skills to reinforce – standing or sitting in the reward zone with a loose leash. This is why it is important to practice each tiny step or part of a behavior individually, and put the chain together slowly. Alexandra discusses training a horse to walk on lead in her blog and the method is the same when training a dog to walk on leash (dogs prefer a different treats than horses, of course). But because the horse is a lot bigger, there is less room for sloppy training. Dog owners will tolerate their dogs jumping and pulling at the end of a leash, horse owners could be killed by this. Horses need to walk calmly on lead and respond to rope cues reliably, always. And Alexandra teaches horses this skill step by step with positive reinforcement, increasing the myelin insulation of the preferred neural pathways by frequent repetition. I was reminded of automaticity – how a skill becomes automatic – recently when a wind storm caused a power outage for several hours at my house. Even though there was no power, every time I went to the bathroom (a room with no windows) I still reached for the light switch and turned the light switch on. That’s how automatic I want my dog’s response to be when I say his name – turn to me for direction every time I say his name. That’s how automatic I want my dog’s response to be when he retrieves a bird or goes through the weave poles in agility. 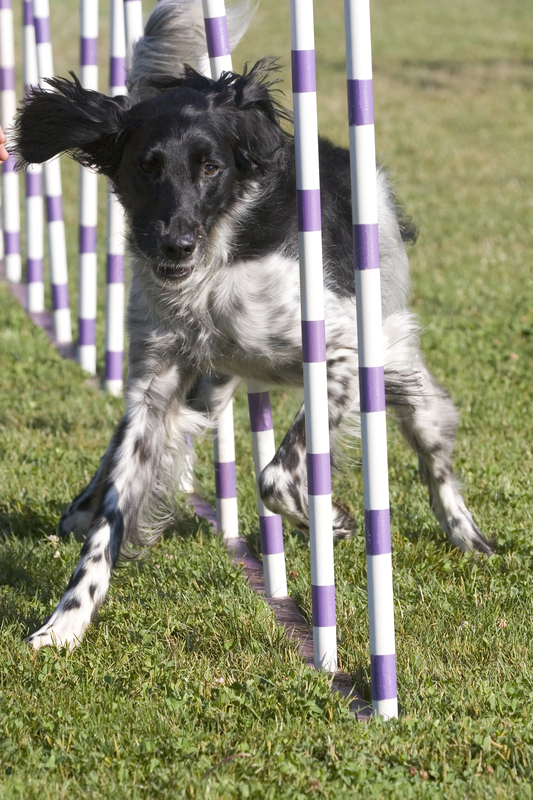 Agility enthusiasts and others who train dogs for performance may forget that the foundation needs to be laid, the parts of a chain need to be practiced, the neural pathways need to be established and insulated, before the whole chain can be strong. Speed can come later, and can be reinforced later – after the first steps are solid. The neuroscience is also telling us that we need to focus on setting our dogs up for success, not constantly testing them and hoping they will fail so we can “correct” them. That will only cause the dog to practice the neural pathway that we don’t want. By observing our animal’s actions carefully and making small increases in distraction, duration, distance, speed, and other criteria of training behaviors; we can maintain correct responses and increase learning in our dogs.